There are more than 20 restaurants at Beaches’ resort in Turks and Caicos. Our family has eaten at 18 of those restaurants (and both food trucks!) and we think four of them are excellent. The others range from very good to good. We were pleasantly surprised by the food overall. Here are short reviews of each restaurant that we've eaten at, plus, our favorites. Schooners has a roof, but no walls. The white tables and old-fashioned ceiling fans give the restaurant a relaxed Caribbean vibe. Many of the weddings we’ve seen at Beaches had the reception here. Breakfast: 7:30 a.m. to 11:00 a.m.
Dinner: 5:30 p.m. to 9:30 p.m. Dress Code: Shirts and footwear required. Swimwear must be covered. Schooners is a full service restaurant in the Caribbean Village with an open-air dining room. The servers are friendly and there is live dinner music in the evenings, but the food service is slow. That's not a big deal for breakfast, but its a bummer when a family dinner drags on (kids meals are usually the first ones out of the kitchen, thankfully). There is a bathroom inside this restaurant, which is nice, because most of the restrooms on the resort are located in common areas that are near the restaurants, but rarely in them. There is a patio and a manmade beach in front of the restaurant, which is a nice place for kids to escape to while parents watch from the dining room. Bella Napoli is an outdoor pizzeria in Beaches’ Caribbean Village. It’s a convenient way to grab lunch without having to leave the pool area. Daily: 11:00 a.m. to 5:00 p.m.
Bella Napoli is an open-air pizzeria behind the Iguana Pool in the Caribbean Village. Our family hasn't eaten here, but we had excellent pizza from a similar restaurant in the Italian Village (Dino's Pizzeria Italiana). Dinner: 6:00 p.m. to 9:30 p.m. Dress Code: Evening wear. No shorts, swimwear, t-shirts, sleeveless shirts or sneakers allowed. Sopadillas is an adults-only gourmet restaurant in the Caribbean Village, next door to Reflections (it's hard to tell where one restaurant ends and the other begins). The restaurant has the strictest dress code on the resort, but not everyone follows it. The service at Sopadillas is good overall and the ambience has become much more romantic since the restaurant was renovated after Hurricane Irma. And the food, oh yes, the food. It's awesome from start to finish. The ceviche, jerk-style dishes and banana rum tart are excellent. Sopadillas and Le Petit Chateau (in the French Village) are our two favorite restaurants for dinner. The Jerk Shack is located on Treasure Beach, home to Beaches’ Friday night beach party. Daily: 11:00 a.m. to 5 p.m. The Jerk Shack is a small hut on Treasure Beach (on the edge of the Caribbean Village) that serves Jamaican Jerk chicken and pork. It's a great place to grab a beer and a sandwich in a wet bathing suit. 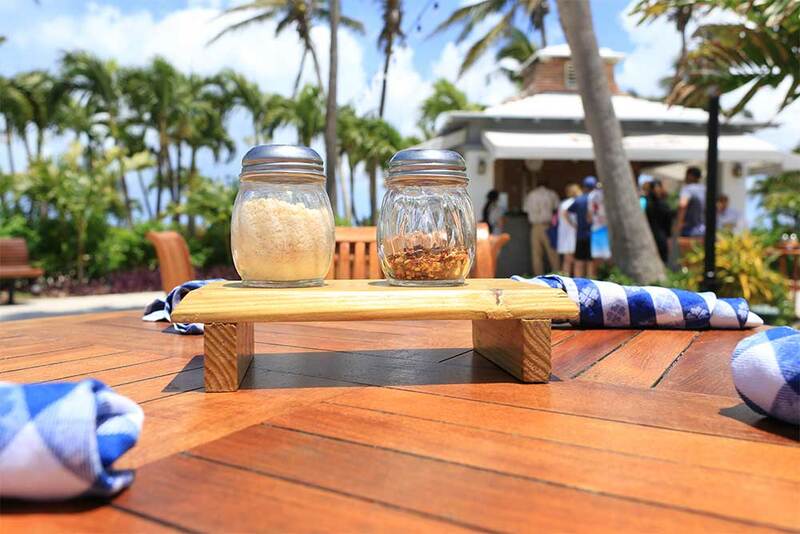 There are plenty of picnic tables to sit, or you can take your lunch to the Grace Bay beach. The bar at Jerk Shack also serves rum drinks. Lunch: 12:30 p.m. to 2:30 p.m.
Reflections is a buffet-style restaurant inside of the Caribbean Village's main lobby. Most of the seating is indoors, but there is also a large patio for outdoor dining. We've had good breakfasts and lunches at Reflections, but we've never eaten dinner here. Like all buffet-style restaurants, it's best to arrive early before the food gets dry. This is especially true for fish dishes. The day campers from Camp Sesame (ages three to five) have lunch at Reflections, so expect plenty of kids on the patio area in the afternoon. The gyro and taco station at Arizonas (in the Caribbean Village) is wonderful. There is lamb on a spit, pork on a smoker and all kinds of proteins on the grill. Also, the sauces near the grill are great. Lunch: 12:00 p.m. to 4:00 p.m.
Arizonas restaurant is beside the Cascades Pool in the Caribbean Village. It's a buffet-style restaurant with indoor and outdoor seating. The outdoor taco/gyro station is awesome. There is freshly-grilled (or barbecued) beef, lamb, pork, chicken and sometimes, seafood. There is also a great selection of salads, vegetables, kiddie foods (like chicken nuggets) and deserts at the buffet. This our favorite lunch spot on the resort, by far. Beaches’ Cafe de Paris makes dozens of pastries, but many of them are similar. We like to order the ones that are most different from one another. Don’t forget coffee! Cafe de Paris makes the best espresso drinks on the resort. The French Village's Cafe de Paris makes the best coffee on the resort. The baristas are friendly and there is a selection of a dozen or more types of pastries. Some of the pastries are excellent, but they can start to taste the same if you have too many of them (which is easy to do). Better to order in small batches. Take-out boxes and coffee carriers are available; they’re a good way to bring desert back to your room (or wherever). Soy is a sushi restaurant that is (somewhat strangely) located in the French Village. The restaurant looks hip and modern, and there is a lovely outdoor lounge area with couches and chairs. We've only been to Soy once during our three stays at Beaches. The sushi was like what you'd find at an OK-but-not-great Japanese restaurant. Lots of guests love Soy. We're kind of spoiled because we have a great, cheap sushi restaurant in our neighborhood back home. Daily: 10:00 a.m. to 6:00 p.m.
Mr. Mac is a food truck in the French Village, right beside the waterpark. The truck serves macaroni and cheese in about 10 varieties. The macaroni is dripping in cheese, kind of like a Velveeta sauce. It's served in small cardboard containers that have an annoying habit of blowing away in the wind if you don't hold on to them. This is a great spot for a hungry kid to grab a bite between meals, or, for having a wet lunch when you're spending the whole afternoon in the waterpark. Le Petit Chateau is an adults-only gourmet restaurant: It may be our favorite at Beaches. We've had excellent meals (the food at Sopadilla's in the Caribbean Village is a close rival) and the service at Le Petit Cheteau is the most professional and prompt that we've experience on the resort. There is a full bar inside of the restaurant, so almost any drink is available. Wine is served is real stemware, and even though its probably in our heads, everything seems to taste better when you drink it out of a fancy glass. There is one downside to Le Petit Chateau: The main entertainment stage is right outside. It's not a dealbreaker for us, but you might hear Elmo from Sesame Street in the background of a romantic dinner. Dinner: 5:00 p.m. to 9:30 p.m.
Kimonos is a hibachi restaurant like Benihana. It's on the outskirts of the French Village, right beside Soy. Kimonos is the only restaurant on the resort that requires a reservation and it does get busy. In true hibachi style, the chefs put on a show as they cook, doing spatula tricks and flinging food into people's mouths. If you've been to one hibachi restaurant, you've been to all hibachi restaurants, but it's fun (especially for kids). 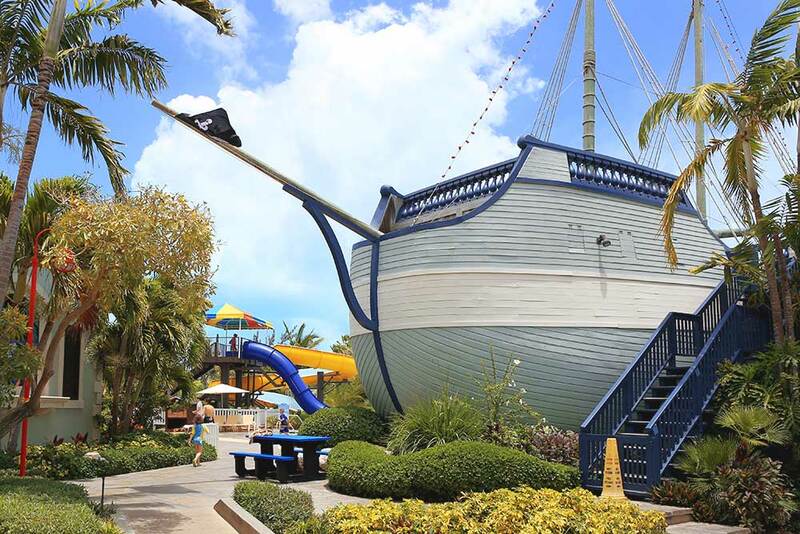 Bobby Dee’s is located inside the Jolly Roger pirate ship in Beaches’ Pirate’s Island Waterpark. Bobby Dee's is a throwback 1950s-style diner inside of the Jolly Roger pirate ship at the waterpark. It serves American fast food favorites like burgers, fries, pizza, chicken nuggets and ice cream. The food is OK, but you can get a better meal at almost any restaurant on the resort. The great thing about Bobby Dee's is convenience. It's open 19 hours a day and has takeout boxes. The place used to be mobbed all day long, but the addition of the two food trucks in the waterpark made Bobby Dee's much less crowded. 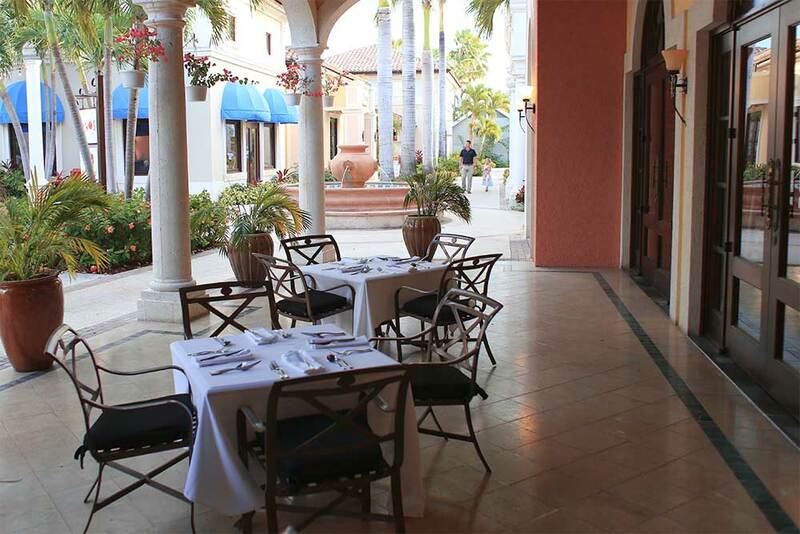 Giuseppe's is a restaurant with indoor and outdoor seating, located by the French Village Pool. Drink service is slow (especially outdoors), and while the food is good overall, we didn't find anything distinctive or remarkable about it. We skipped Giuseppe's on our last trip. Curls 'n Swurls is a small food truck located inside of the waterpark. It serves the best ice cream on the resort (technically, it's frozen yogurt). Every flavor we tried was great and the flavors rotate daily. We didn't try a milkshake, but we definitely will next year! Daily: 12:00 p.m. to 2:00 a.m.
We've never eaten at Cricketer's (but we've taken bags of popcorn to-go almost daily). Cricketer's serves classic pub food like fish and chips and meat pies. This pub also has the largest selection of beers on the resort. It's located behind the Italian Village Pool. The tables behind Mario’s restaurant are quiet and secluded: a great place to have a relaxing meal. Mario's is a castle-like restaurant with a huge buffet. It has indoor and outdoor seating and there is a special section of kid-sized tables and chairs inside the restaurant. We've never eaten inside Mario's because the air conditioning is always cranked up. It's freezing! Breakfast buffets are pretty similar from one restaurant to the next, but Mario's has the best scrambled eggs on the resort. Dino's is an open-air pizzeria located behind Mario's restaurant in the Italian Village. (In the evening, it turns into the Bombay Club Indian restaurant). Our family ate at Dino's once. The pizza was very good, but it took a long time to arrive. The Bombay Club serves a prix fixe menu of traditional Indian dishes, served family style. Hold on to your papadum, it can blow away in the wind! The Bombay Club is a prix-fixe Indian restaurant behind Mario's. (It's a quiet escape from the rest of the Italian Village.) We had great service here and the food is better than average, but we left disappointed. Why? Beaches once had an amazing restaurant called A Taste of India. The Bombay Club is good, don't get us wrong. But, A Taste of India was great (we miss you Chef Baki!). 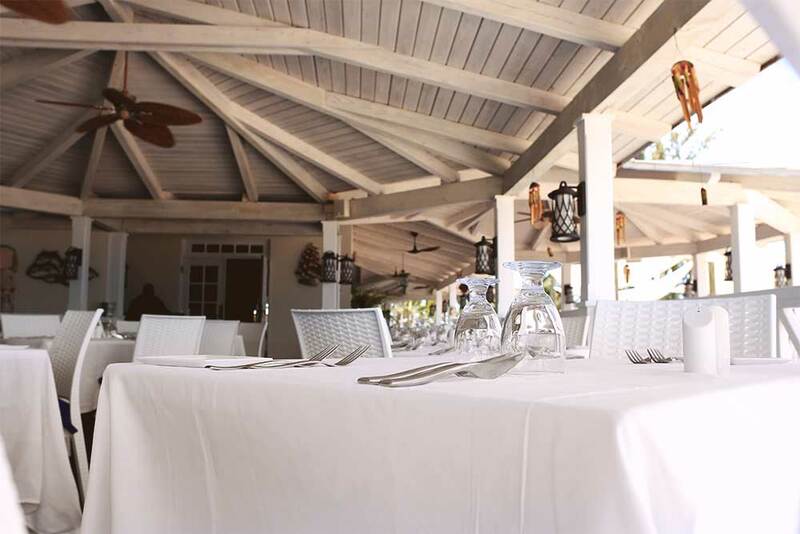 Barefoot by the Sea is an open-air table service restaurant (with a roof, but no walls), nestled on a man-made beach between the Grace Bay sand dunes and the Italian Village Pool. Food service is very slow, but the food is among the best on the resort. There are lots of great seafood choices, from conch fritters to Jamaican foil-wrapped fish. 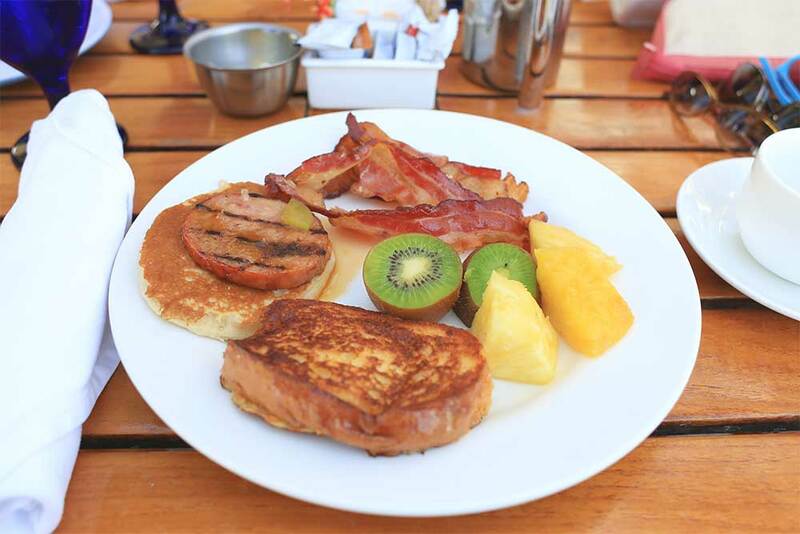 Bayside is one of our favorite restaurants at Beaches Turks and Caicos. We often eat breakfast there (and always on our last day), but Bayside also has a great dinner buffet that includes sushi! Bayside is the biggest restaurant in the Key West Village. It's buffet-style and has lots of shaded outdoor seating thanks to large umbrellas. 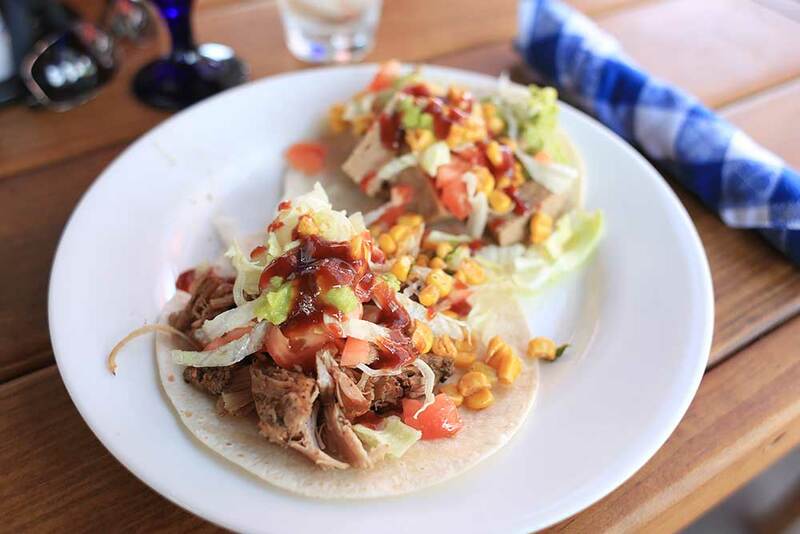 We eat at Bayside often because its easy to get a seat, the food is very good, there is live music in the evenings, and the drink service is quick because there is a full bar inside the restaurant. During our last stay, we discovered the sushi bar at the front entrance. The rolls were surprisingly good! 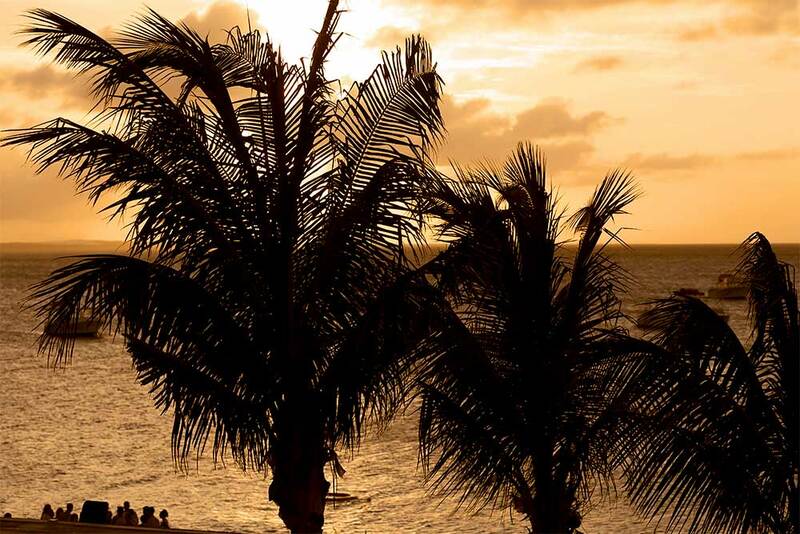 Sky Restaurant is the best place to see the sunset over Grace Bay at Beaches’ resort in Turks & Caicos. 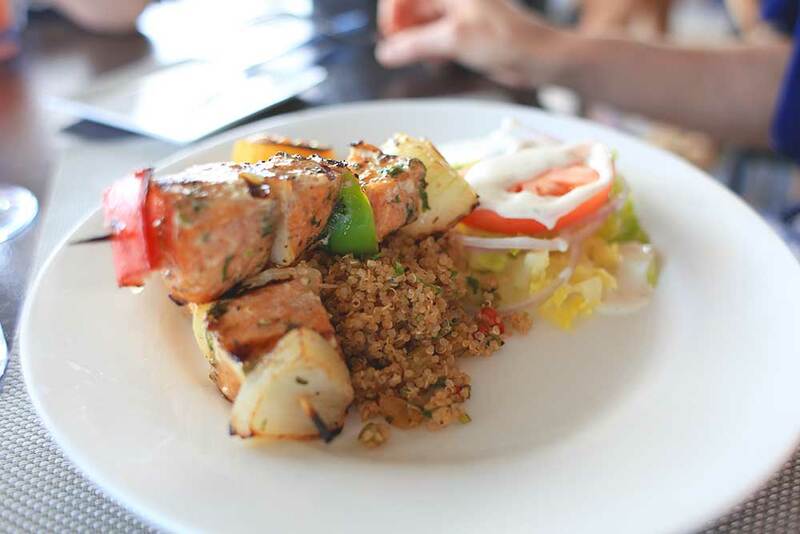 Neptunes serves large portions of excellent food that is plated beautifully (see our salmon skewers and couscous above), but kitchen service is very slow. Neptune is a table service restaurant along the sand dunes in the Key West Village. The restaurant has a roof, but no walls, making it a good choice to avoid the sun without feeling stuffy. The seafood dishes are excellent and the food is very good overall (the portions are big, too), but the kitchen service is slow. Drink service is speedy and the servers make an effort to bring kids meals first, which is nice. The restaurant has a small bar within it, but if you order a frozen drink, your server will have to get it from the Bayside Bar next door. One of the biggest knocks we have against Neptune has nothing to do with the restaurant itself. There are feral beach cats that live on the sand dunes, and of course, some guests feed them (don't blame the kids, it's usually the parents!). It's hard to have a romantic dinner while watching a mangy cat try to debone a fish. Are there vegetarian and vegan dining options? Yes, many of the restaurants at Beaches indicate which dishes on the menu are meat and/or dairy-free. Do the restaurants at Beaches accommodate food allergies or other special requirements? Yes, however, this is one aspect of Beaches that our family doesn't have any firsthand experience with. Beaches recommends that travelers with dietary restrictions speak with their booking agent before traveling and also speak with the Executive Chef upon arrival.